Meeting at Westminster, 6 Dec. Present: Chancellor, Great Master, "etc., ut supra." Business:—The Knight Marshal had letters to the Admiralty to provide a vessel for the avoiding of the Egyptians, and letters to the Deputies of Calais and Boulogne to avoid them at their arrival there. 505. St. Mauris to Prince Philip. Alarm in the French Court at defeat of the Protestants. Commissioners of France and England have been assembled in Calais for a long time and are likely to separate without doing anything. The King has lost hope of an arrangement and hates the King of England worse than ever; and that King as deeply distrusts him, as his ambassador tells me. England is offended that the galleys should be still kept at sea, which are now near Rouen and, it is said, will go to the east in spring. Renewed edicts against exporting wheat or barley. Angers, 6 Dec. 1546. 506. On the Defeat of the Protestants. Et Saxo conversus est retrorsum. Et pedites ut agni ovium. Quid est tibi Lantgravie quod fugisti? Et tu Saxo quod conversus es retrorsum? Et Hispani ut agni ovium? Et Lutheranismum in sinceram Fidei consonantiam. Ne quando dicant Germani; Ubi est Lantgravius noster." P.1. In a later hand. Headed: "Allegorica translatio Psalmi 113, in victoriam Caroli Q. quam de Lantgravio Hasse reportavit, anno Domini 1547." 507. Edmond Harvel to Henry VIII. The Turk left Constantinople for Andrinopoly, on 18 Oct., for the winter. He makes great preparations against next summer, and, as his custom is when he goes to war, "made great alms" before departing. Dr. Girardo, the Emperor's ambassador had not begun to negociate with the Turk because of sickness. The truce between Ferdinando and the Turk expires "by all March." A French gentleman lately passed to the Turk in haste. Piero Stroci and the Signor of the Mirandula are here. Many think, them occupied about differences with Countye Piero Maria of Sansecondo "concerning battle between them," but some suspect affairs of the French king. Lately the cardinals of Trent and Fernesy, with Don Diego, were here four or five days, only for "solace"; and afterwards Fernesy departed towards Plaisance and the others returned to Trent. It is reported from Rome that the Bishop refuses to contribute more to this war of Germany unless the French king enters their league. Reports from Germany are very variable, but both armies seem bent to continue in the fields. The Emperor has lost by arms, cold, hunger and sickness above 15,000 "soldates." There has been mention of peace between the Emperor and Protestants by mediation of the Countye Palatin and the Conty of Beury. Strange rumors are spread that Duke Mauricio of Saxony has invaded the Elector's state and taken part with the Emperor and Ferdinando, "to the which is given no credit." The Bishop intends to make ten new Cardinals, mostly for money. Venice, 6 Dec. 1546. Meeting at Westminster, 7 Dec. Present: Chancellor, Great Master, "etc., ut supra." Business:—Messyr Bellislavo, Hungarian, had passport over seas and letters to Cavendish for his year's pension beforehand, and 50l. in reward, and to Mr. Harvell, ambassador at Venice, for conveyance of his advertisements. Meeting at Ely Place in Holbourne (no date given). Present: Chancellor, Great Master, Great Chamberlain, Admiral, Paget. Business:—Warrant to Williams for 100l. in reward to Mr. Beneves and Mr. Leslie, gentlemen of Scotland. Signifies, for the King's information, that he spoke this afternoon with Duke Philip, who in few words explained his desire to speak with the King and delivered signed instructions from his uncle with a letter of credence (both sent herewith). Pray take a copy of the instructions and return him the original, with the King's answer. Also sends letters out of France from Mr. Wootton, somewhat touching those matters of Denmark whereof Duke Frederic writes, and the copy of the proclamation in France whereof Wootton wrote. The French ambassador should be spoken with therein, and touching the letters of reprisal of which Wootton lately wrote. The French ambassador's secretary has just come to tell me that le Sieur Doysy, who at the beginning of the peace passed into Scotland, is here, returning thither with a message from the French king, his master, that if the Scots who lately committed piracy upon "your Majesty's subjects and those of Flanders" were not compelled to make satisfaction and punished, he would forbid them his ports and arrest them. This, the secretary said, was the sum of Doysy's message, "believe him if ye will, but I do not." I guess it to be rather for some other practice, "even as I think verily Polyn's coming is for none other." On your signifying the King's pleasure touching Doysy's passport my Lords will despatch it. The Emperor's ambassador sent also to ask when he might speak with the Council concerning the arrests. Pray let me know if his Majesty continues in the resolution, declared to the Ambassador at Portesmouth, and afterwards at Windsor, that our ships in Spain being released upon caution (which the Ambassador now promises) such things as Reneger took shall be restored, "and then Reneger to have justice against them which injustly staid his prize in Spain." Had other men who received portions of Reneger's prey been as ready to render it as the King all this bruslery had been past. Pray let me know the King's pleasure to-morrow. The news of the Lantgrave's desperate passage and breaking up of the Protestant camp is written by Mr. Wotton from the French king's report; but Duke Philip had letters of the 18th ult. that the army was together. If any such extremity had chanced, the King should know ere this, or my lord of Westminster were much to blame, and Bruno is not altogether to be excused. Ely Place, "where we are in expectation of the return of my lord of Hertford and my lord Admiral," 7 Dec. 1546. Since he wrote last, on the 3rd inst., the Lady Regent has had letters out of Almayn. Is informed that the Landsgrave's camp is broken, himself gone to the County Palatyne, the Duke of Saxe gone home with 10,000 footmen and 3,000 horsemen, and the rest of the camp retired with the Duke of Wyttynbergh for the safeguard of his country. The Emperor lays siege to Ulmes. The Lady Regent has privily sent Skyperius to the Emperor, dressed like an Almayn with leathern cloak and Almayne dagger. He departed hence on the 4th inst. Bruxelles, 7 Dec. 1546. Signed. On 25, 27 and 28 Nov., wrote to Mr. Wotton by Mons. de Pockere, the French king's gentleman, who departed hence upon the bruit of the Lansgrave and Duke of Sax going away from their army. Since Norling surrendered, Dingelspill, another frank town also surrendered, and two or three gentlemen's castles about here; after that Rotinburgh, and, as Grandevela told me, Hale, another free city. He said also that the Count Palatine comes to desire pardon, and the Duke of Wirtinburgh sues for grace, but is told that he must submit himself and his state to the Emperor's pleasure. News from the camp will be seen in Signor Barnardine's letter herewith. Expects to continue turmoiling through this dangerous country all winter, as the Emperor means to effect his purpose before the spring. The Cardinal of August was appointed governor of Norlinge, and wrote to all the ambassadors who were in Tillinge after the form of his letters to me. That to the French ambassador only differed from mine by being in French while mine was in Italian. Intended to follow Barnardyne to the camp; but the purpose was broken, as will appear by Barnardyne's letter from Norlinge. Sends also copy of an extract of two letters shown him by the Venetian ambassador. On the 7th inst. the French ambassador went to the camp for audience. Was told by Grandevela the day before that the ambassador said it was for a great matter, but he did not know what. Thinks that the French king entertains the Emperor with offers; but to conclude a matter of importance would use another minister than his ambassador here resident. Reported what Grandevela said touching this by letters of 11 Nov. While writing this, received Barnardyne's letters from the camp herewith; and, as he desires to return into England, makes this despatch by him and sends copies of letters heretofore written. Would be glad to know that Somerset returned safely, by whom he advertised the King of the Emperor's answer, and sent the story of events here "script. 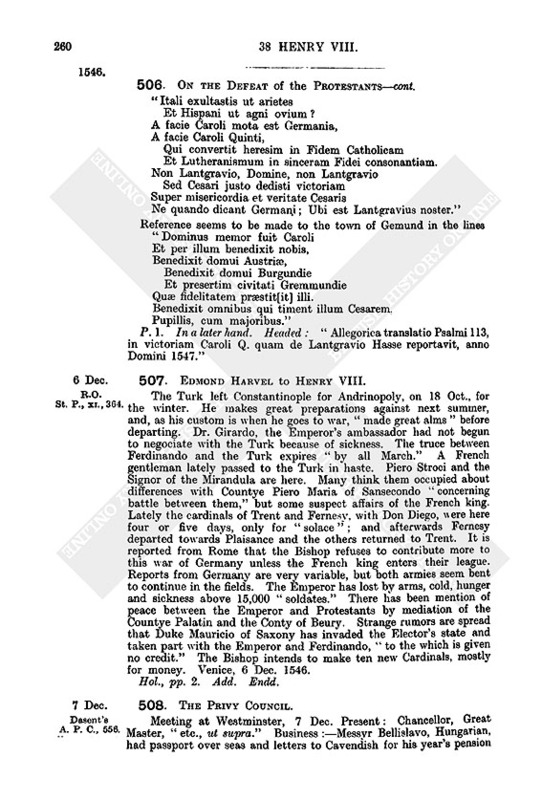 Latine, Anglice, Italice et Barbare" and also the letters found at Newborough castle. Herewith is a letter he received from the Venetian ambassador touching Grandevela's departure from Lawingen. Grandevela sent word two hours "within night" that he would depart next morning early, and advised Thirlby to wait until further advertised of the Emperor's pleasure. The French ambassador, who received like notice, accompanied Grandevela, who "chafed" thereat (as the writer's man, sent to prepare his lodging at Norlinge, and say that he would not tarry behind, reported). Followed next day, with a good company and guides, for the peasants who have been spoiled and burnt have slain many travellers. Grandevela promises to give notice of his departure hence, so that the writer may accompany him. Barnardyne can report what has passed here; whose charges homewards Paget may recompense, as Thirlby has much ado to pay his own, all things (including money) being dear. Norlinge, 7 Dec. 1546. P.S.—Hale is not surrendered and the Emperor will be there to-night to take it perforce. Ere Barnaldyne receives these letters and departs he will be able to report certainly. 2. Copy of the above without the postscript. Pp. 2. Endd. : The copye of a l're sent by Mr. Barnardyn to Mr. Paget. Bill, made 8 Dec. 38 Hen. 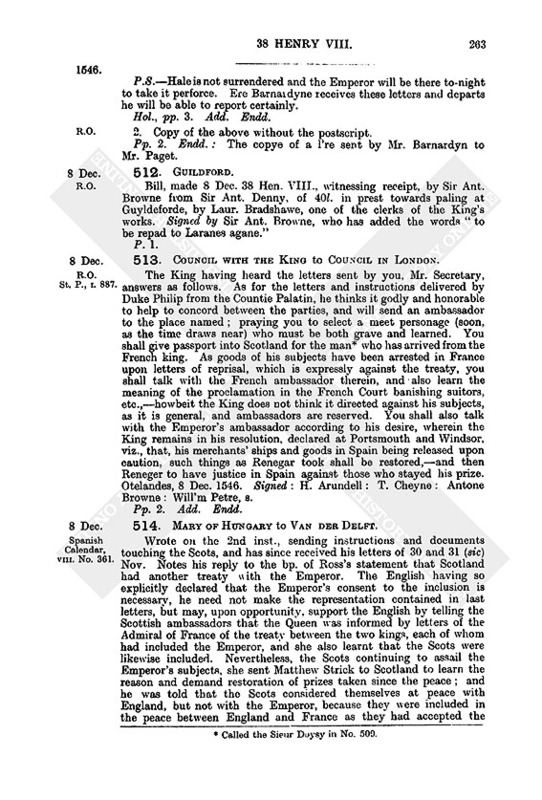 VIII., witnessing receipt, by Sir Ant. Browne from Sir Ant. Denny, of 40l. in prest towards paling at Guyldeforde, by Laur. Bradshawe, one of the clerks of the King's works. Signed by Sir Ant. Browne, who has added the words "to be repad to Laranes agane." 513. Council with the King to Council in London. The King having heard the letters sent by you, Mr. Secretary, answers as follows. As for the letters and instructions delivered by Duke Philip from the Countie Palatin, he thinks it godly and honorable to help to concord between the parties, and will send an ambassador to the place named; praying you to select a meet personage (soon, as the time draws near) who must be both grave and learned. You shall give passport into Scotland for the man (fn. n1) who has arrived from the French king. 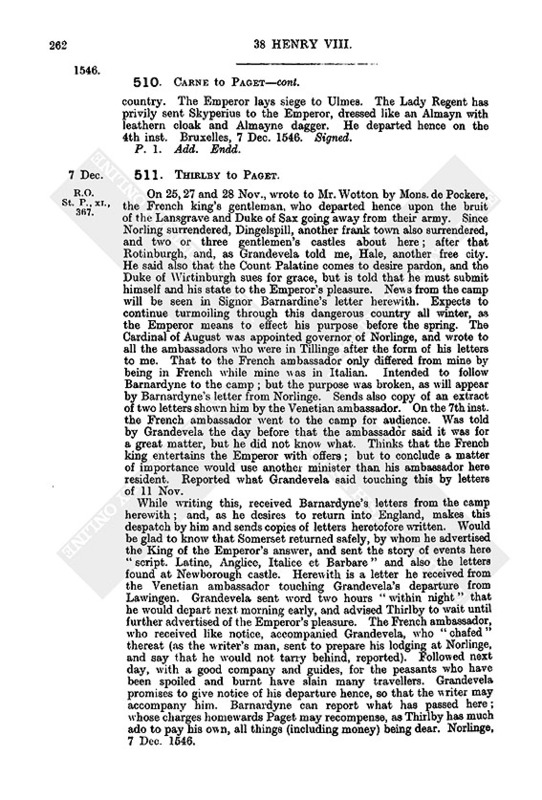 As goods of his subjects have been arrested in France upon letters of reprisal, which is expressly against the treaty, you shall talk with the French ambassador therein, and also learn the meaning of the proclamation in the French Court banishing suitors, etc.,—howbeit the King does not think it directed against his subjects, as it is general, and ambassadors are reserved. You shall also talk with the Emperor's ambassador according to his desire, wherein the King remains in his resolution, declared at Portsmouth and Windsor, viz., that, his merchants' ships and goods in Spain being released upon caution, such things as Renegar took shall be restored,—and then Reneger to have justice in Spain against those who stayed his prize. Otelandes, 8 Dec. 1546. Signed: H. Arundell: T. Cheyne: Antone Browne: Will'm Petre, s.
514. Mary of Hungary to Van der Delft. Wrote on the 2nd inst., sending instructions and documents touching the Scots, and has since received his letters of 30 and 31 (sic) Nov. Notes his reply to the bp. of Ross's statement that Scotland had another treaty with the Emperor. 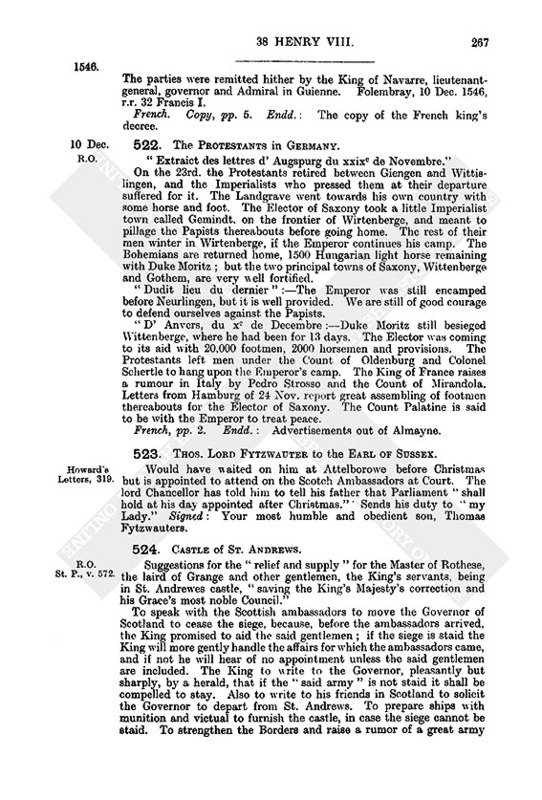 The English having so explicitly declared that the Emperor's consent to the inclusion is necessary, he need not make the representation contained in last letters, but may, upon opportunity, support the English by telling the Scottish ambassadors that the Queen was informed by letters of the Admiral of France of the treaty between the two kings, each of whom had included the Emperor, and she also learnt that the Scots were likewise included. Nevertheless, the Scots continuing to assail the Emperor's subjects, she sent Matthew Strick to Scotland to learn the reason and demand restoration of prizes taken since the peace; and he was told that the Scots considered themselves at peace with England, but not with the Emperor, because they were included in the peace between England and France as they had accepted the conditions; but that treaty was only binding upon the contracting parties—an interpretation at variance with the alliance with England, by which the latter could not include the Scots without the Emperor's consent. The bp. of Ross had no reason to ask so pointedly if Van der Delft was instructed to confirm the English Chancellor's words about the joint war, since he had said the same thing to Strick in Scotland with a view to arouse distrust between England and us; and he knows that, at Brussels, he was plainly told that the Emperor would not negociate without the co-operation of England, and that for this sole reason the Emperor had refused to include the Scots in the treaty of Crespy. If the Scottish ambassadors again mention, in presence of the English, another treaty with Scotland, Van der Delft shall answer that he has never heard of such a treaty, and does not believe that they can show one which could weaken the treaty of alliance between the Emperor and England. Beyond this he shall not go unless the Scots produce or quote from the agreement of Antwerp; but if they do so he shall satisfy the English by using the arguments contained in his instructions. He must try to avoid any dispute about that agreement in presence of the English. 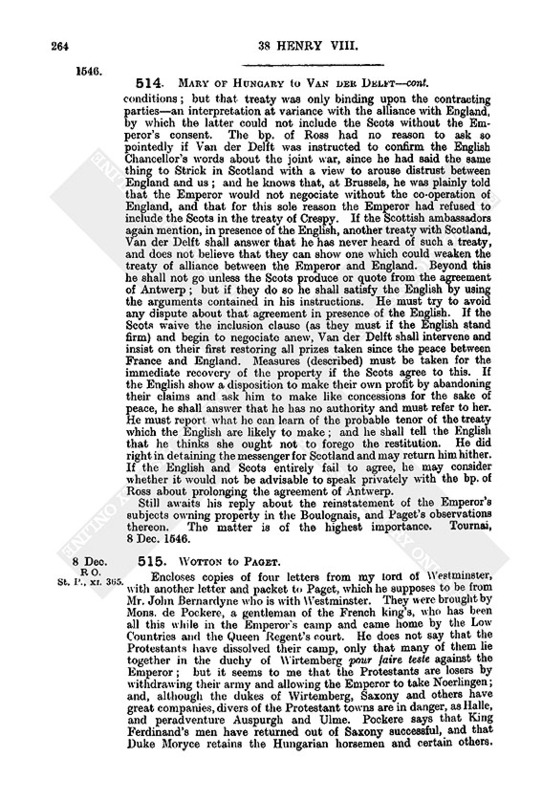 If the Scots waive the inclusion clause (as they must if the English stand firm) and begin to negociate anew, Van der Delft shall intervene and insist on their first restoring all prizes taken since the peace between France and England. Measures (described) must be taken for the immediate recovery of the property if the Scots agree to this. If the English show a disposition to make their own profit by abandoning their claims and ask him to make like concessions for the sake of peace, he shall answer that he has no authority and must refer to her. He must report what he can learn of the probable tenor of the treaty which the English are likely to make; and he shall tell the English that he thinks she ought not to forego the restitution. He did right in detaining the messenger for Scotland and may return him hither. If the English and Scots entirely fail to agree, he may consider whether it would not be advisable to speak privately with the bp. of Ross about prolonging the agreement of Antwerp. Still awaits his reply about the reinstatement of the Emperor's subjects owning property in the Boulognais, and Paget's observations thereon. The matter is of the highest importance. Tournai, 8 Dec. 1546. Encloses copies of four letters from my lord of Westminster, with another letter and packet to Paget, which he supposes to be from Mr. John Bernardyne who is with Westminster. They were brought by Mons. de Pockere, a gentleman of the French king's, who has been all this while in the Emperor's camp and came home by the Low Countries and the Queen Regent's court. He does not say that the Protestants have dissolved their camp, only that many of them lie together in the duchy of Wirtemberg pour faire teste against the Emperor; but it seems to me that the Protestants are losers by withdrawing their army and allowing the Emperor to take Noerlingen; and, although the dukes of Wirtemberg, Saxony and others have great companies, divers of the Protestant towns are in danger, as Halle, and peradventure Auspurgh and Ulme. Pockere says that King Ferdinand's men have returned out of Saxony successful, and that Duke Moryce retains the Hungarian horsemen and certain others. Wrote lately that when the Emperor's ambassador said that the Count Palatine was going to the Emperor, the French king answered that he was so sick that the physicians despaired of his life. Pockere says that there was a bruit in the Emperor's camp of his sickness and death, but that it is not so and he is indeed going to the Emperor. He says also that before the Protestants withdrew they passed by the Emperor's camp as if provoking him to battle; whereupon Mons. de Bure said "Sir, now is the time, if you will fight this day and let me lead the vauward you shall be assured to have peace as long as you live." The Emperor made him "a Spanish answer," that the thing was impossible, as he could not live in peace though he had overcome the Protestants. Received Paget's letter of the 1st inst. Here is much speaking of the succour sent into Scotland. "I pray God you may find the Scots that are with you so conformable that we have no new war with them and with these men again, for I for my part love nothing worse than war." Chauny, 8 Dec. 1546. Meeting at Ely Place, 9 Dec. Present: Chancellor. Great Master, [Great Chamberlain, Admiral, Paget]. Business:—Sir Ric. Lee had warrant to —— for provisions of Warke Castle. 517. Selve to Francis I. Received on the 7th the despatches of the 1st and 2nd, brought by the Sieur. d' Auzis and the gentleman, bearer of this, lately sent to France by Selve; and on the 8th the despatch of the 5th containing instructions about the Scottish affair. The Scottish ambassadors are very pleased with the King's decision. Selve's audience is deferred to Sunday or Monday because he would not communicate his message to Paget. The excuse was that the King had such a cold that he could not speak, but the fact is that he is as well as usual and goes daily to the fields. Could not until to-day get the order for post horses to Scotland for M. d' Auzis, and then only by alleging that he was sent about depredations by Scottish pirates upon the Flemings and English on the French coast. Gave him an instruction (copy herewith) to show the French ambassador in Scotland the King's desire that the Scottish ambassadors at London should not pass into France unless together. Had already spoken to the ambassadors against it, and the bp. of Ross had answered that, at the return of the herald whom they despatched into Scotland on the 5th inst., one of them might be ordered to pass into France. Mr. Adam Hotbourne, on the 5th inst., sent word by Selve's servant that his companion was an Imperialist, at the same time delivering a letter to the Queen of Scotland to be forwarded in Selve's packet. 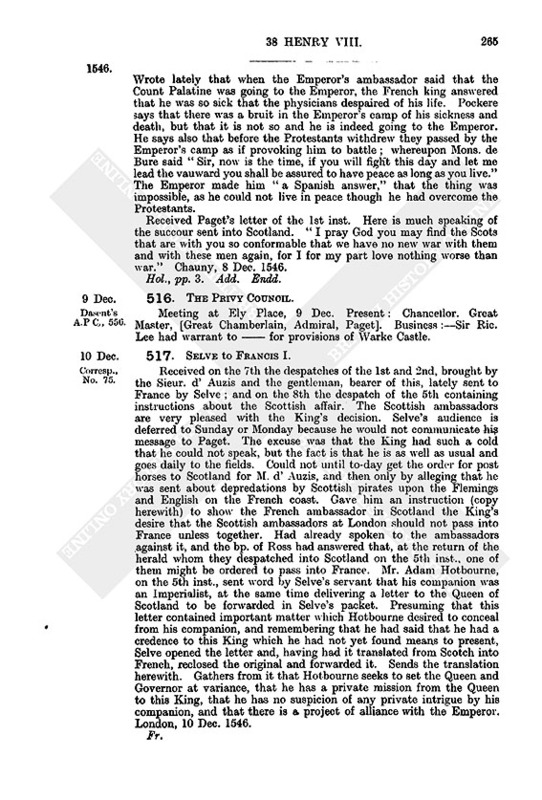 Presuming that this letter contained important matter which Hotbourne desired to conceal from his companion, and remembering that he had said that he had a credence to this King which he had not yet found means to present, Selve opened the letter and, having had it translated from Scotch into French, reclosed the original and forwarded it. Sends the translation herewith. Gathers from it that Hotbourne seeks to set the Queen and Governor at variance, that he has a private mission from the Queen to this King, that he has no suspicion of any private intrigue by his companion, and that there is a project of alliance with the Emperor. London, 10 Dec. 1546. 518. Selve to the Admiral [of France]. Has shown the Italian (fn. n2) the Admiral's message but he makes more difficulties than ever upon the danger to himself of his naming anyone. Has not much faith in the man; but cannot help thinking that the English have some evil intention of surprising us somewhere, and that he knows it. Saw the King's instructions to the Sieur d' Auzis. The matter touching the King of Denmark's desire (volunté) which he is therein commanded to keep secret was common bruit in this town ten days ago, and the Scottish ambassadors here may have advertised the Governor of it, who might conceive suspicion if he perceived an inclination to attempt something in this quarter without his knowledge. Anger at seeing himself slighted, fear of rendering an account as Governor, liberal offers from England, and hatred of the Queen (which he bears, whatsoever pretence he may make to the contrary) might then make him do something which Selve can scarcely dare to think. But it may well be feared, from his long tarrying before a castle with few people inside, whom he has allowed (as Selve is informed and this King by him) to parley with the English ships, in the face of himself and his army; and on pretext of this two (fn. n3) of them have gone out of the castle. M. de la Garde arrived last night. Paget sent word to-day that he would arrange for him and Selve to have audience together. The Admiral of England has said that the Scottish ambassadors shall have audience of the Council to-morrow; but they have not vet heard of it. London, 10 Dec. 1546. Replies to L'Aubespine's letter of the 2nd. that he has never thought that there was any trust to be reposed in the Italian and still less in the nation; but has from the beginning feared the risks against which he is warned. The danger of omitting anything seems greater than that of being held responsible for falsehoods. London, 10 Dec. 1546. 520. James Cokburn of Langtown to Hertford. Lately I wrote your Lordship my mind in all behalfs and, now my Lord Bothuill has directed bearer, his secretary, to the King's [Majesty], pray "cause him to be convoyt in quiet maner," and answer my last letter by him. Langtoun, 10 Dec. Signed. P. 1. Add. : To my lord Erle Harfurd, etc. 521. The Goods arrested at Bordeaux. Francis I's mandate to the judge or lieutenant of the Admiralty of Guienne at Bourdeaulx, to restore the cloth, leather and lead of Gregory Pecoq, Wm. Jonson and George Jobz if he finds them to have been unlawfully arrested. 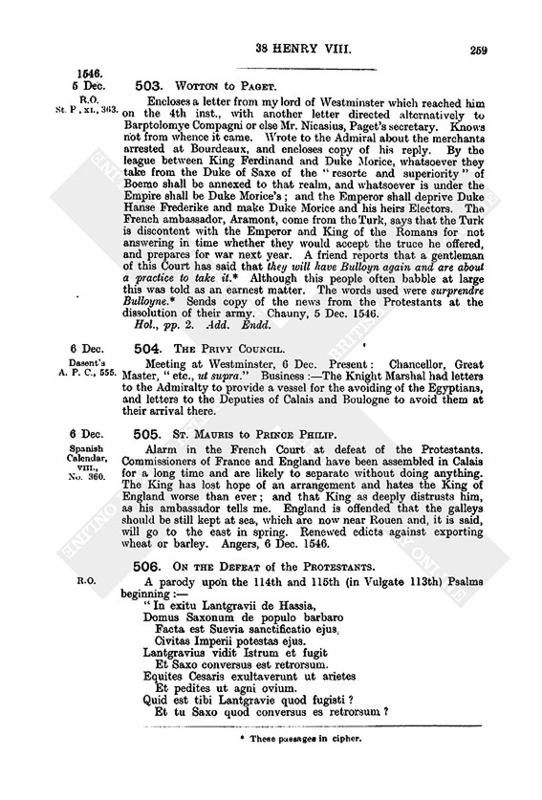 The preamble states that the Privy Council is informed that Estienne de La Can, Pierre Chapilhon de Grantmont and Guillaume Aige, merchants of Bordeaulx, upon letters of marque and reprisal issued for 500 tuns of wine taken from them at the haven of Farjeux in England by Robert and Alexander Brutz, seized the said cloth, leather and lead on 26 Oct. last, whereas the treaty with England expressly states that such letters are not to be executed except against the authors of the depredations therein mentioned. The parties were remitted hither by the King of Navarre, lieutenant-general, governor and Admiral in Guienne. Folembray, 10 Dec. 1546, r.r. 32 Francis I.
French. Copy, pp. 5. Endd. : The copy of the French king's decree. 522. The Protestants in Germany. "Extraict des lettres d' Augspurg du xxixe de Novembre." On the 23rd. the Protestants retired between Giengen and Wittislingen, and the Imperialists who pressed them at their departure suffered for it. The Landgrave went towards his own country with some horse and foot. The Elector of Saxony took a little Imperialist town called Gemindt. on the frontier of Wirtenberge, and meant to pillage the Papists thereabouts before going home. The rest of their men winter in Wirtenberge, if the Emperor continues his camp. The Bohemians are returned home, 1500 Hungarian light horse remaining with Duke Moritz; but the two principal towns of Saxony, Wittenberge and Gothem, are very well fortified. "Dudit lieu du dernier" :—The Emperor was still encamped before Neurlingen, but it is well provided. We are still of good courage to defend ourselves against the Papists. "D' Anvers, du xe de Decembre:—Duke Moritz still besieged Wittenberge, where he had been for 13 days. The Elector was coming to its aid with 20,000 footmen, 2000 horsemen and provisions. The Protestants left men under the Count of Oldenburg and Colonel Schertle to hang upon the Emperor's camp. The King of France raises a rumour in Italy by Pedro Strosso and the Count of Mirandola. Letters from Hamburg of 24 Nov. report great assembling of footmen thereabouts for the Elector of Saxony. The Count Palatine is said to be with the Emperor to treat peace. French, pp. 2. Endd. : Advertisements out of Almayne. 523. Thos. Lord Fytzwauter to the Earl of Sussex. Would have waited on him at Attelborowe before Christmas but; is appointed to attend on the Scotch Ambassadors at Court. The lord Chancellor has told him to tell his father that Parliament "shall hold at his day appointed after Christmas." Sends his duty to "my Lady." Signed: Your most humble and obedient son, Thomas Fytzwauters. 524. Castle of St. Andrews. 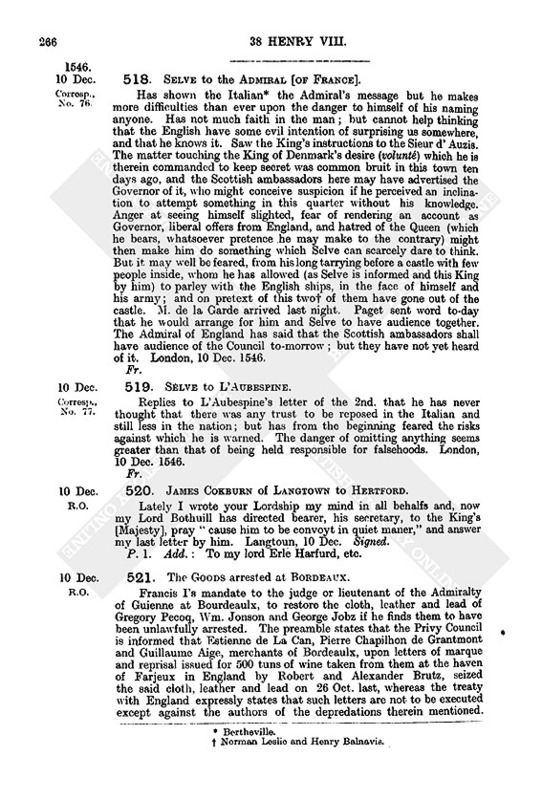 Suggestions for the "relief and supply" for the Master of Rothese, the laird of Grange and other gentlemen, the King's servants, being in St. Andrewes castle, "saving the King's Majesty's correction and his Grace's most noble Council." 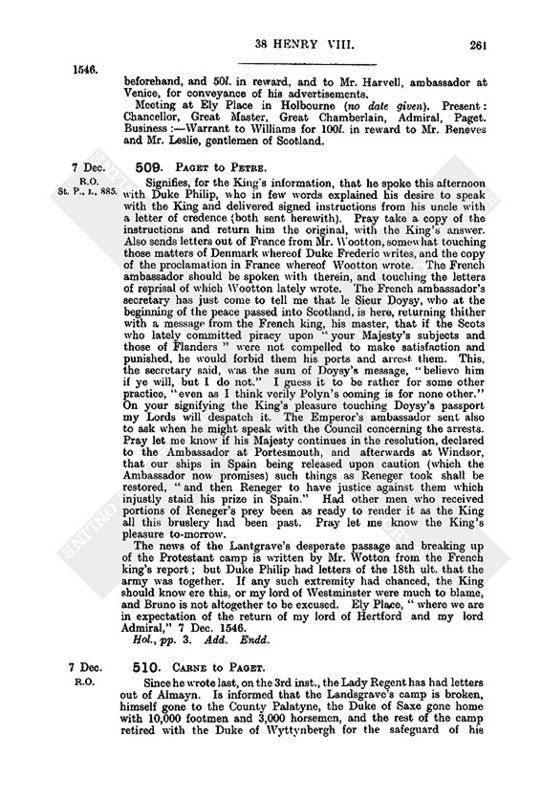 To speak with the Scottish ambassadors to move the Governor of Scotland to cease the siege, because, before the ambassadors arrived, the King promised to aid the said gentlemen; if the siege is staid the King will more gently handle the affairs for which the ambassadors came, and if not he will hear of no appointment unless the said gentlemen are included. The King to write to the Governor, pleasantly but sharply, by a herald, that if the "said army" is not staid it shall be compelled to stay. Also to write to his friends in Scotland to solicit the Governor to depart from St. Andrews. To prepare ships with munition and victual to furnish the castle, in case the siege cannot be staid. To strengthen the Borders and raise a rumor of a great army coming in all possible haste to destroy Leght and Edenbrughe if the first peace and contract of marriage is not fulfilled. To make proclamation on the Borders that such as promote the said peace and contract shall be considered the King's friends. Lenoux might be sent to Carlisle, and the Borders warned, as though he should invade the West; which should "much fear the Governor." All means failing to bring the Governor from the siege, ships of war must land 10,000 or 12,000 men at St. Andrews, risking some loss for the sake of "the weighty things that are to follow upon these purposes." Meanwhile "we must have some writings conveyed secretly to our friends in Scotland" to get intelligence. We refer all to the King and his Council. The above in an English hand, although to some extent in Scottish idiom. Continued in the hand of Henry Balnavis.—If the King send an army by land to Leitht, doing no harm by the way and granting assurance to ilka man that will come for it to the lieutenant at Leitht and give security to the King's contentation, this shall either daunt the south side of the water of Fortht or else draw the Governor from St. Andrews, and meanwhile the whole country will be drawn to the King's pleasure. 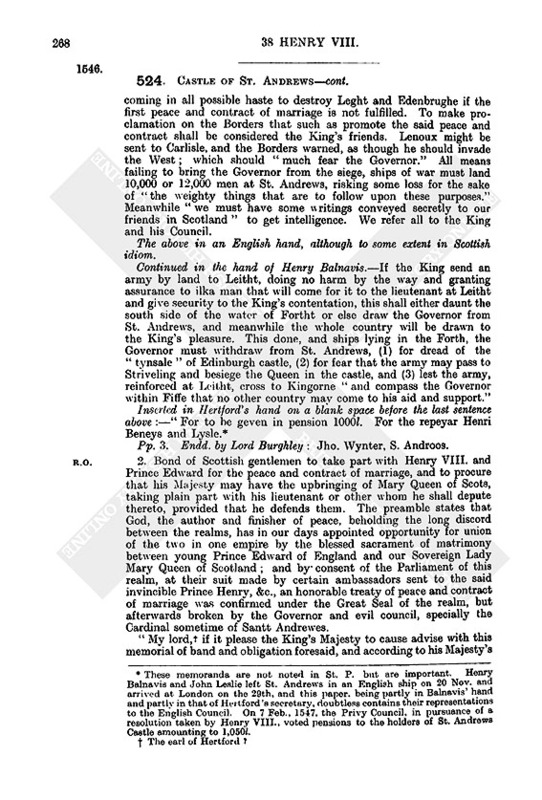 This done, and ships lying in the Forth, the Governor must withdraw from St. Andrews, (1) for dread of the "tynsale" of Edinburgh castle, (2) for fear that the army may pass to Striveling and besiege the Queen in the castle, and (3) lest the army, reinforced at Leitht, cross to Kingorne "and compass the Governor within Fiffe that no other country may come to his aid and support." Pp. 3. Endd. by Lord Burghley: Jho. Wynter, S. Androos. 2. Bond of Scottish gentlemen to take part with Henry VIII. and Prince Edward for the peace and contract of marriage, and to procure that his Majesty may have the upbringing of Mary Queen of Scots, taking plain part with his lieutenant or other whom he shall depute thereto, provided that he defends them. The preamble states that God, the author and finisher of peace, beholding the long discord between the realms, has in our days appointed opportunity for union of the two in one empire by the blessed sacrament of matrimony between young Prince Edward of England and our Sovereign Lady Mary Queen of Scotland; and by consent of the Parliament of this realm, at their suit made by certain ambassadors sent to the said invincible Prince Henry, &c, an honorable treaty of peace and contract of marriage was confirmed under the Great Seal of the realm, but afterwards broken by the Governor and evil council, specially the Cardinal sometime of Santt Andrewes. "My lord, (fn. n5) if it please the King's Majesty to cause advise with this memorial of band and obligation foresaid, and according to his Majesty's mind to be 'eakid' and extended with such necessary other clauses and points as please his Majesty, I trust there should be many gentlemen of Scotland appliable thereto,—so that it be kept secret while it come to effect, and that no man know it except a few number of the Privy Council while it break forth in Scotland of the self, etc." Pp. 3. In Balnavis' hand. n1. Called the Sieur Doysy in No. 509.
n3. Norman Lesie and Henry Balnavis. n4. These memoranda are not noted in St. P. but are important. 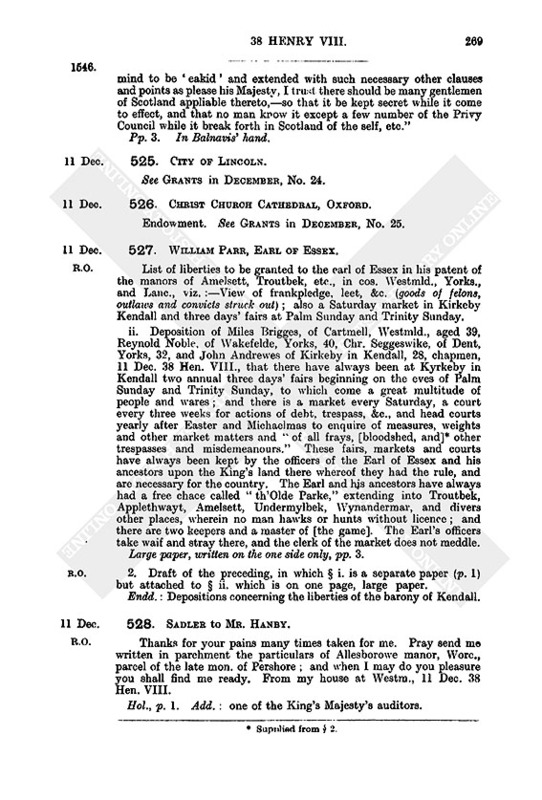 Henry Balnavis and John Leslie left St. Andrews in an English ship on 20 Nov. and arrived at London on the 29th, and this paper, being partly in Balnavis' hand and partly in that of Hertford's secretary, doubtless contains their representations to the English Council. On 7 Feb., 1547, the Privy Council, in pursuance of a resolution taken by Henry VIII., voted pensions to the holders of St. Andrews Castle amounting to 1,050l. n5. The earl of Hertford?